WHAT A NIGHT! 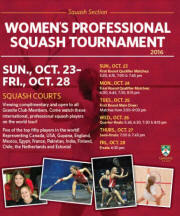 The squash lounge is still buzzing as I type this write up. 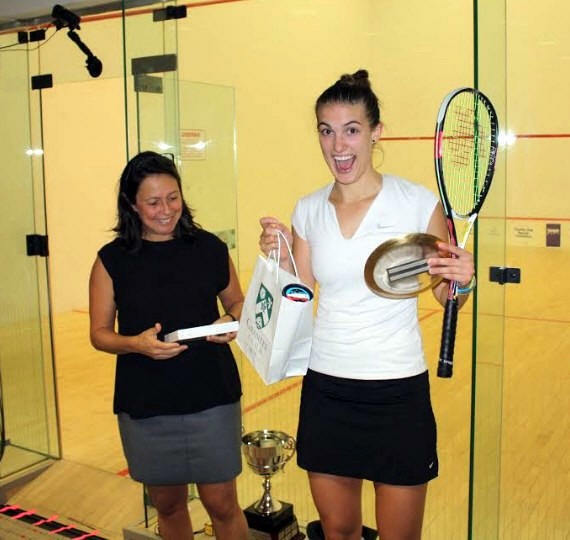 People cannot believe the terrific week of squash that we have witnessed. And what a final, to finish things off! 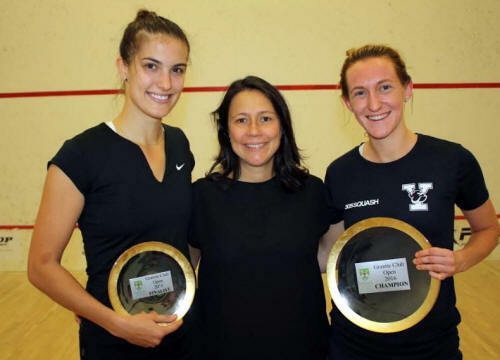 Millie Tomlinson and Sam Cornett were both competing in their 13th tour final, but for both, it was their biggest tour final to date. We knew it was going to be tight, and they did not let us down. The first game was super long. Both girls trying to figure each other out. They played great rallies and went back and forth throughout, Millie getting to 9-7 up before Sam pulled it close to 9-9, only to have Millie win the next two points to take game 1. The second game was more of the same. Millie perhaps a little less tentative than Sam, and that was the difference. This game could also have gone either way, but Millie came out on top to win 13-11 in the second. The third looked like it may be the same situation, but at 5-5, Sam started to volley like crazy, and Millie, with a couple uncharacteristic unforced errors, let Sam pull away to win 11-5. The fourth game was amazing getting to 7-7. And then, out of nowhere, Millie hit two, off her feet, cross court volley nicks to pull ahead and take the wind out of Sam's sails! Millie won the fourth 11-7 to win the match 3-1. Well, well, well! 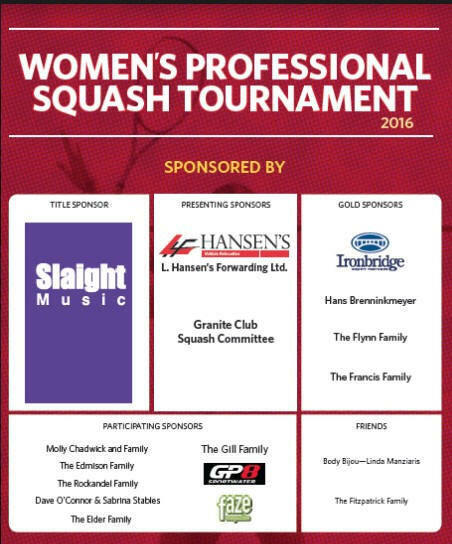 Our Granite Pro, Sam Cornett has made her first Granite Open Final!!!! 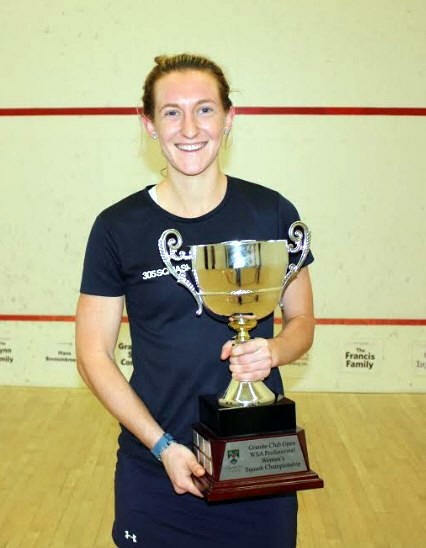 Tomorrow night is going to be a great match vs Millie Tomlinson who came through an exciting five game battle! The night started out with 4 awesome pros offering their time to come and hit with our top juniors from 5:15 to 6:15. The kids rotated through every court and got time with each pro. At the end of the session, each of the pros spoke highly of our juniors and gave some great tips that they can take away to practice. Thank you so much to Hollie, Chloe, Janet and Nouran. This is something the kids will always remember. In the first game, Nada kept attacking and Millie defended everything, until Nada went too fine and made some errors. The start of the second game looked like Nada may be willing to hang in there for the long haul and lay off her attacking ways. But soon, her patience wore out and Nada started to make unforced errors letting Millie pull away and finish comfortably. In the third, Millie looked comfortable until Nada finally was willing to be patient with her and cut out her errors. This led Nada to third and fourth game wins, forcing an anticipated fifth. 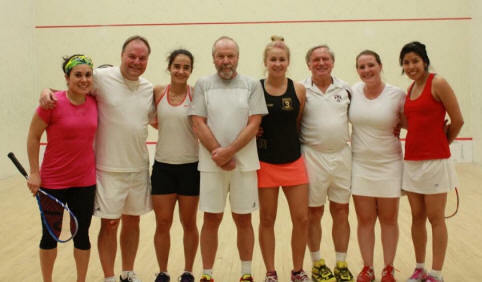 Millie stepped up the pace and Nada ran out of steam to produce an astonishing 11-0 fifth game. Great maturity and focus by Millie. Congrats! What can I say about the new Sam Cornett?!?!?!? After a year off with injury, Sam has come storming back onto the PSA scene. Tonight she played with lots of confidence, assertiveness, and good choices about attacking. Poor Sam Teran, a crowd favourite, had to work hard after a tough mental and physical battle last night. It was so nice to watch the two Sams play. Both such great athletes and lovely women. 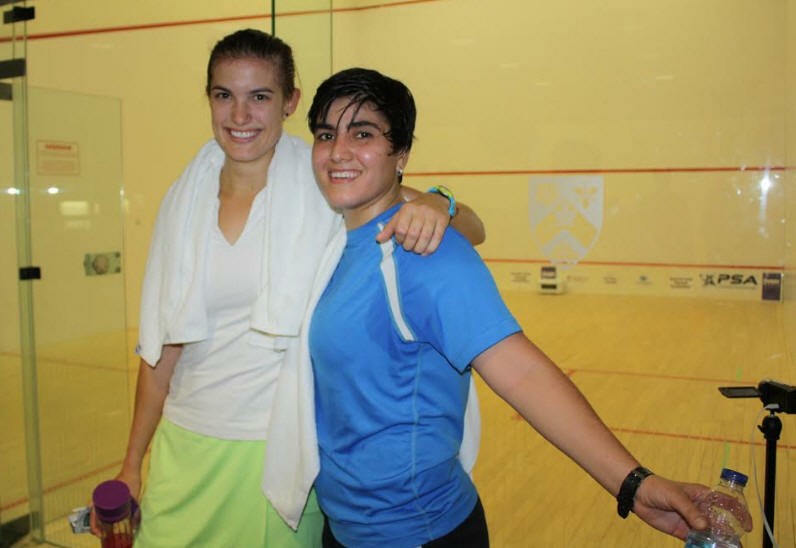 Nouran stormed to a 6-1 lead, but similar to yesterday, Millie fought back to take the first game. After a call to Egypt between games, Nouran pulled ahead again, only to have Millie creep back in and stay ahead through the second game and to finish the match. Best coach Alison was on the scene to help her teammate out. Sam continued her assertive ways as she muscled confidently through the first game. Maria, with her great hands and fast deception, kept both the second and third games close, but Sam pulled away in each with terrific retrieving and tight counter drops. Throw in some timely volley drops and match to Sam. Wow. Two great athletes. Unreal counter drops and terrific pick ups were rampant in this match. There were great attacks, solid volleys, and good length from both. The crowd loved every second of it… me too! A fiery and physical battle with a hint of sass! Great tenacious squash from both players. The first three games were closely contested. The fourth game was absolutely fierce hitting from both as the finish line drew closer. Teran and Naughton were firing in great boasts. Naughton put in a beauty rally at 9-7 down, but Teran still pulled ahead to take that game with a back wall nick! Teran pulled way ahead in the 5th, 9-1, despite huge effort from Naughton. A squeeze from Teran gave her game ball. There was a blood break here, which could have turned the tides, but Teran ended up taking the match on the first opportunity. 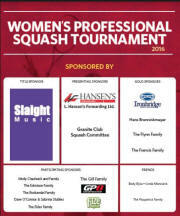 Our night started with the annual Pro Am sponsor doubles event, where 4 great pros offered their time. Nicolette, Ally, Giselle, and Diana were put to the doubles test! There was a bit of controversy with ex pro Steph Edmison playing as an Am. She is, after all, a sponsor! The finals came down to Gary Slaight and Nicolette vs Steph Edmison and Diana, and all we know is that the scoresheet says "Steph Cheated!!" One of the less experienced players is quoted to have said “I felt scared” [out there on the doubles court]. Anna started the match off strong to take a 6-2 lead. But then Sam figured it out and settled in nicely to win a tight 13-11 first game. Sam took a confident second game but Anna had one last fight in the third making it a great battle but a 3-0 win to Sam. Nouran stormed out to a 6-0 lead and didn’t look back, winning the first game 11-3. 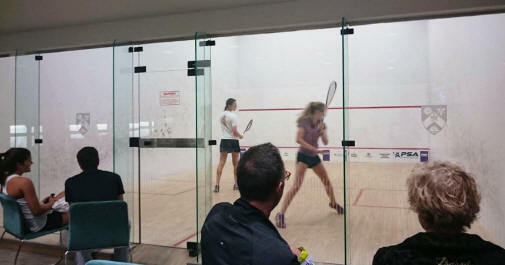 The second game was much more of a fight with Elena taking an early lead but Nouran digging in to close out the second 11-8. The third game saw Elena take a 9-2 lead. Nouran came all the way back to 9-9 before Elena hit a cross court nick winner off the return of serve and then a racquet error by Nouran gave the third to Elena. Nouran started the fourth with renewed focus. Even though Elena battled the whole way with some terrific forehand volleys and great court coverage, Nouran stayed ahead the entire time. Emilia went up 1 game to love. Millie, having just arrived Monday night, took a while to warm up but started to pick up Emilia’s drops from the back court and won the second game. The third game went back and forth but Millie stayed patient and consistent to the the 2-1 lead. Emilia got a little frustrated in the fourth, allowing Millie to keep a comfortable lead throughout the game towards her 3-1 win. A high paced match from the start. Both girls making great gets, taking good space through the middle and finishing rallies nicely. Second game, Nada attacked relentlessly but Nicolette picked up everything. Still, Nada’s clean straight backhand length and drops carried her to a 2-0 lead. It was more of the same in the third, with great attack, unreal athleticism and fascinating squash. Fiona came out playing terrific, and Sam, perhaps with the stress of the home crowd, Sam looked a little like a deer in headlights. Halfway through the second Sam settled in. 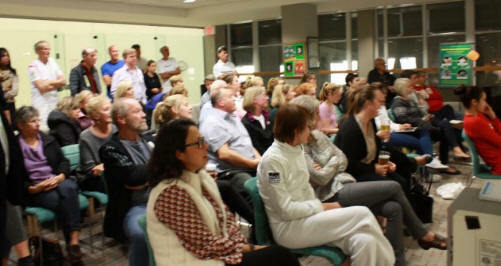 Fiona hit some great volley drops generating cheers from her two English fans who came all the way from her hometown. 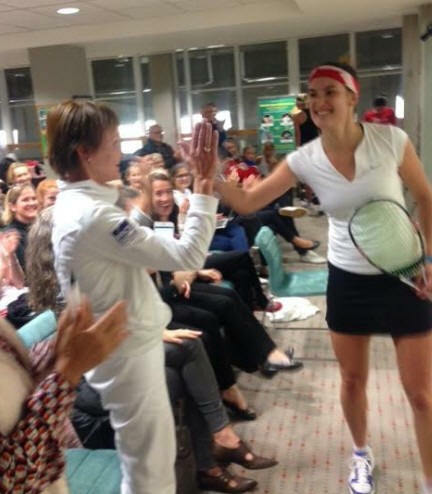 But Sam bore down, as the crowd cheered her along to a great, assertive win. It seems every time we turn around, we are watching another great match between Danielle and Hollie. 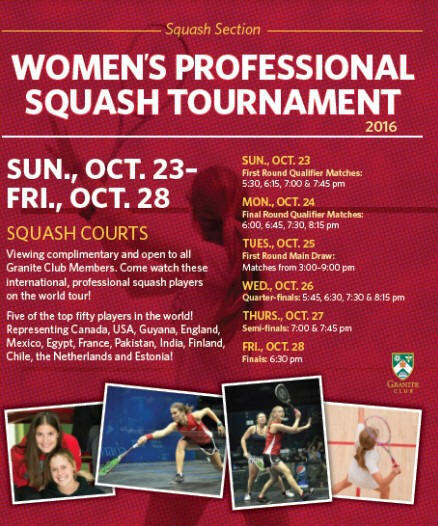 The two Canadian team members have gone back and forth in recent matches and this match was going to be no different. A 45 min 3-1 match was filled with volleys, intensity and lots of great athleticism. Nikki showed her speed in the first game, picking up all of Haley’s great volley drops to win the first. Haley took a quick 7-2 lead in the second but as Nikki is known to do, she closed the gap to 7-6. The girls went back and forth to a 14-12, two love lead for Nikki. Nikki was amazing in the third and her last shot summed it up when she stuck an inch perfect backhand volley drop to finish the match. Last match of the evening! Very short rallies dominated this match. Maria’s short game was too strong for the French player, with lots of hard drives and kills. The underdog comes through a solid 3-0. Tough evening for the seeded players tonight! Mendez built a strong lead in the first to get to game ball, and Delgado battled back to 9-10. A great get but a drop back on herself gave the game to Mendez on a stroke. The next two games saw great rallies but too many cross courts from Delgado gave Mendez opportunities. A 13 minute 40 second long and conservative first game with lots of length gave Kimberley a 1-0 lead. She started the second off aggressively with 3 great drops and some attacking play which gave her a 6-1 lead. Thomson clawed her way back to 8-8 and finally got her first lead at 9-8. With a stroke to finish off the game 12-10 Thomson ties the match at 1-1. Third game Thomson picked up everything Kimberly thought she put away, and then with some unfortunate unforced errors Ali was able to take the game 11-6. The fourth game was a see saw battle, with Kimberly using counter attacks off the boast to tie the match up 2-2. 5th started out back and forth again but Kimberly uses a great BH kill to set up her first match ball. Thomson fights back in a huge scrambling rally only to finish off in a let. And then another huge rally, both girls picking up every ball, but Kimberly finishes it off 11-6. It was a 9pm start for these two players but nonetheless they started fast and furious out of the gates. Soini didn’t hold back with confident attack. She was relentless, even going for a crosscourt nick on game ball. In the third game, Garcia was ready to battle and stayed close to Soini throughout. A stroke on match ball and Soini is through to the main draw. 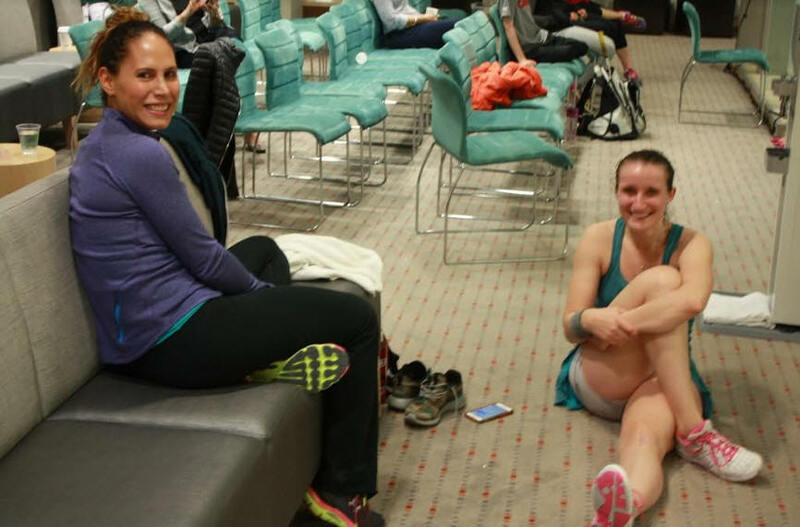 Both Mendez and Vidhi had a nervous start to the match, but Mendez eventually settled in. She showed her experience to stay on top of Vidhi. Vidhi threw in some great boasts. Mendez countered well, played smart length and good straight drops to negate Vidhi’s attack. Stephan and Seth were both volleying well through the match. Stephan took the first two before Seth could battle back at her in the third, pushing ahead 7-2. Stephan battled back to 8-8 and steadied to win 11-9 in a close hard fought third game. Kimberly took the first game quickly, moving Keating front to back. The second had great rallies, despite the scoreline. Kimberly kept building the pressure throughout each rally until Keating couldn’t get to the next shot. The Englishwoman’s short game was too strong for our local player. Perhaps the three tournaments Seanna was playing this weekend got to her in the end!! Kimberly finished the third looking strong. Soini used lots of great height throughout the match. She controlled the T and and moved quickly around the court to keep Manziaris under pressure. Linda kept fighting even at 10-1 down - great experience for her. Wagenmans is very tall and strong. She commands the T and volleys well. McGillicuddy scrambled well and got lots of balls back. She fought so hard, and it’s great for her to get to compete at that level. Erica had a big weekend playing at the Junior Gold tournament so we were impressed with her effort out there! Delgado was too strong and picked up more balls than Chadwick was used to. The Chilean player put Molly under too much pressure with her dying length and tight drops. Molly put in an impressive effort, since she also played the Junior Gold tournament this weekend.